From left, front row: Lisa M. Imbriaco, Abington Heights High School; Wendy K. Miller, Benco Dental; Brian Daubert, MCR Design Group; Suzanne O’Donnell, H.W. Roever, Inc.; Charles Curtin, The Honesdale National Bank; and James M. Brown, Marywood University. Back row: Nicole Morristell, director, Leadership Lackawanna; Glenn Layaou, III, Kronick Kalada Berdy and Co.; Allan S. Karaffa , Kronick Kalada Berdy and Co.; James J. Wisnewski Jr., Tobyhanna Army Depot; Richard Rogalewicz, Post Acute Medical Specialty Hospital of Wilkes-Barre; Nick Serniak, NJS Systems and Controls; Matthew R. Kalinchok Commonwealth Health; and Robbie Risley, Quadrant EPP and Leadership Lackawanna board chair. Dr. Antoinette Hamidian of The Aaron Center, Inc. is also a member of this year’s class. 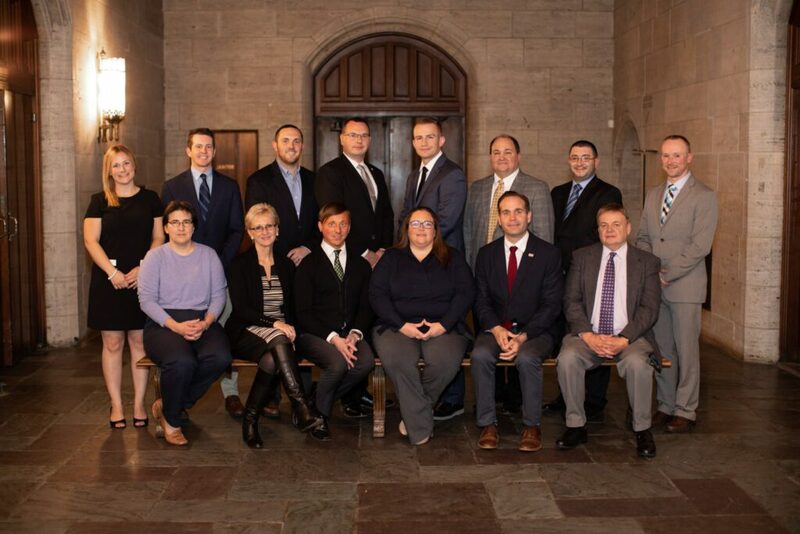 Leadership Lackawanna announced its 2018 Executive Program graduates during a recent celebration at The Scranton Cultural Center at the Masonic Temple. Allan S. Karaffa , Kronick Kalada Berdy and Co.
Glenn Layaou, III, Kronick Kalada Berdy and Co.
Suzanne O’Donnell, H.W. Roever, Inc. Participants met key business and community leaders as they received overviews of Lackawanna County’s history and culture, economic and political structures, community events, civic groups, recreational activities and non-profit organizations. Sessions were held one evening per week for five weeks at various locations.